by Ralph A. Wilson, Jr.
Ralph Alfred Wilson Sr. was born about 6:00am on February 24,1907 in Polk County, on the family farm about 5 miles west of Salem, Oregon, and died at 1:41 am March 6,1995 at Salem. He was the youngest of the seven children of Frank Walter and Nettie (Lansing) Wilson. 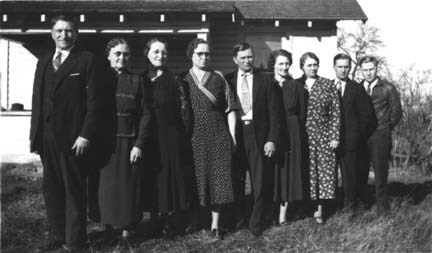 The above picture of his parents and siblings was taken about 1940. No. 1 "Your Mother is always right! she's never wrong. 1A "Regardless of the trouble you're in, or how the world condems you, Mother will still love you -- You mind her!" 2 Education is the pathway to success, teachers are to be listened to. 3 Be honest with others and yourself. 4 Saying "I'm sorry" gets easier with practice, etc. and had his fathers acute sense of justice. his quiet courage was seldom tried. He acknowledged on occassion, mans need for Grace, that hope for man on earth was touch-and-go. He fully subscribed to love. He liked all people, and loved children. Created 13 Jul 1999 by Reunion, from Leister Productions, Inc.